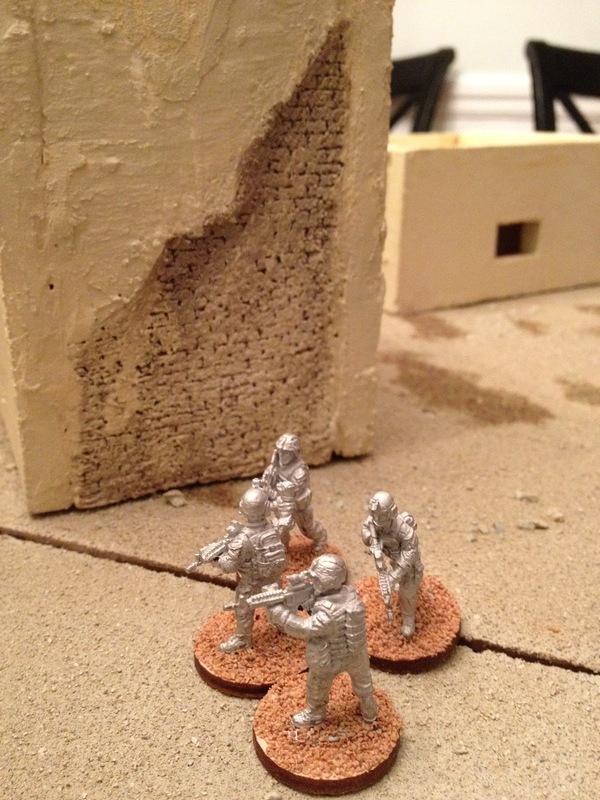 So I was finally ready to start my first official scenario from the Force on Force rulebook, A Few Blocks of Hell. I didn't take (nor did I plan to) enough notes for this to be an actual AAR (After Action Report) to be consumed by wargame hobbyists, but again, wanted to simply document my foray into the hobby itself. Pics and some learnings if your read on. A couple things became apparent right away. One, we're going to need a bigger table. Force on Force is designed as a flexible system, for use with 15mm, 20mm, or 28mm models in mind. 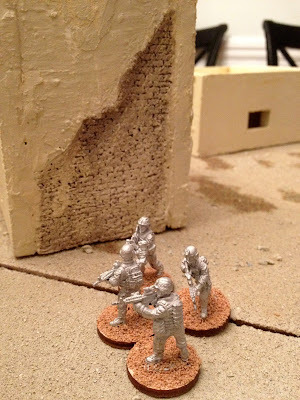 However, the 15-20mm sizes are a bit more table friendly and you really need to double your sizes and ranges when playing 28mm. The original scenario called for a 2' x 2' table. Here, I'm using 3' x 4', which worked, but I'd rather go 4' x 4'. Many future scenarios would actually require a 8' x 8' tabel which, not only do I not have room for, but wouldn't be able to effectively reach across to move one's models around. Ultimately, I'd like to be equipped to handle a 6' x 8' table, but we'll see how that works out. When coercing one's friends over to play a game such as this, it's customary to include some alcohol. For this game it was decided that we would kick things off with "Flaming Dr. Peppers". Flaming Dr. Peppers: Shot of Amaretto topped with Bacardi 151. Set aflame, then drop shot into a glass of light beer, chug said beer. This may not have been the best choice because of the fact we had to work tomorrow, and probably wouldn't be able to remember any rules we learned throughout the game. That said, we still had fun! I've played this scenario again since this game and I adjusted the layout to my board because in both games, the Army hugged the left side. Tactically it makes sense because the don't want to get caught in the street, but we're not utilizing a lot of the scenery. Additionally, this game, we used the standard ranges for movement and added a turn. In the future I'm just going to double ranges and keep the turns the same. I was afraid it would make the game move too quickly, but in practice it worked quite well and felt realistic. If it was suggested in the rule book, I missed it. Markers are pretty much a must have to keep track of who's wounded, to what extent, who's pinned, etc...luckily anything will work. So for this game, I was ripping little bits of various color note cards to indicate light or heavy wound. Since this game I have some new markers to indicate how many times a unit has fired, wounds, hidden, pinned, etc... So far I've just obtained colored tokens, but may upgrade markers in the future. At this point, not a single miniature was fully painted, and many weren't primed. That said, having the buildings completed (if not expertly done) has been keeping me motivated to paint my armies. I'm so eager for the completed models as this will be a great looking game! The brickwork on this building was negatively impacted when I put the plaster "goop" on it. A little too think and there's even a drip on the left side. Not enough to bother me too much, but lesson learned. Jon could only raise his hands in disbelief as the enemy survived, unscathed, a massive salvo from his fire team. All in all, the game is good fun, if not a little head-scratching at times where we needed to consult the rule book. I'm sure as time goes on the turn sequence will run a bit more smoothly!